I was already starting to wake up to what is happening in our country prior to this. After reading this book wow I'm wide awake now there is so much that i hadn't even thought of when it came to terrorists. Having grown up in a high control religion i know how much mind control can make you believe everything your told. You're conditioned not to question anything. I was never taught violence/killing but we were taught hate towards certain religions. The first part of the book i was going to skip at first in so glad i didn't it was needed to understand what i was about to read next. 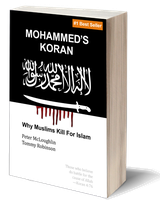 This book is excellent and to anyone who is seeing things in this country and like me are on the fence about what to believe as regards to Islam then you really need to read this. Well done to Tommy and Peter.